Looking to get into the St. Patty’s spirit? 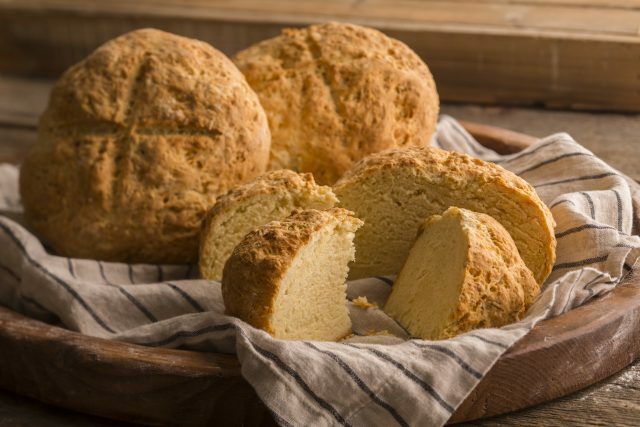 Side your green beer with a loaf of traditional Irish soda bread, courtesy of Kneaders Bakery and Cafe. If you’re not in the mood to heat up the oven, Kneaders has the bread for sale during the entire month of March. Combine flour, sugar, salt, baking soda, butter, egg and buttermilk in a mixing bowl. Mix on low speed just until everything starts to come together into a dough, approximately 1 minute. Finish mixing by hand until all flour is absorbed into the dough. Transfer dough to a lightly floured surface and loosely shape into a round ball. Place onto a greased baking sheet. Slightly flatten the top by gently patting down on it. Use a serrated knife to score an X across the top center of the loaf. Immediately place into the oven. Bake for 35-40 minutes until the internal temperature reaches 190 degrees. Best when served while still warm.